Black diamonds can be a girl’s best friend in Breck – black diamond runs that is – especially during the ski area’s inaugural Women’s Ski Week, Feb. 14-22, 2015. Women’s Ski Week at Breckenridge Ski Resort will highlight the resort’s offerings just for women to help moms, sisters, daughters and girlfriends get the most out of the mountain and town the way only women know how: by providing a welcoming, supportive and fun place to improve skiing or snowboarding skills, meet new friends and take the stress out of planning a family vacation. Created by the most successful woman skier of all time, Lindsey Vonn, Ski Girls Rock features lessons for girls ages 7 to 14 from our top women instructors. The lessons are headed up by devoted women instructors who have had an opportunity to meet with Lindsey recently to understand her vision for Ski Girls Rock and hope to convey this same sense to each of their students. With a maximum of four women per class, the Ladies First lesson gets you more individualized attention with experienced female instructors. Sometimes, a full day lesson can just be a little too much. That’s why we’re introducing Women & Wine – a half day lesson for women only (starting at 1:15 p.m. every Wednesday) followed by a complimentary glass of wine for après. Ski, sip, and play for just as you learn from the best women instructors at Breck. Special for the Feb. 18 session, Gallo wines will join to show off the best wines in their line and explain the proper pairings. This class is held every Wednesday through March 4. 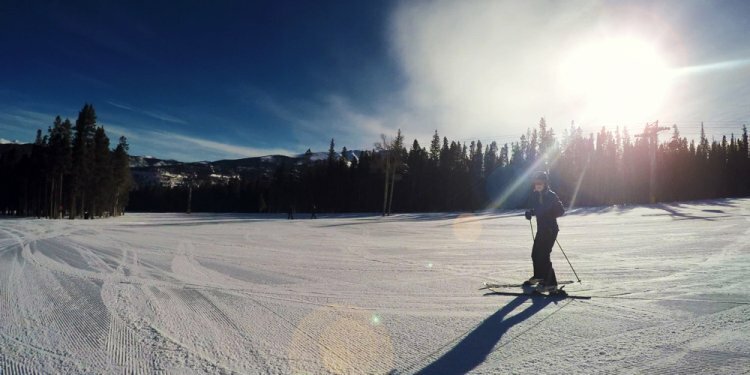 Join Breck February 20 for first tracks on the mountain! Anyone who books a women’s program or lesson this year at Breck will get free access to this event! At Breck’s three-day Women’s Camp, you’ll get exactly what you’re looking for — whether that’s just a bit more confidence in the bumps, or just a better understanding of the equipment on your feet. Our supportive and fun female instructors will break the group down by ability and guide you and your friends around our incredible mountain at your pace. And speaking of feet, Smartwool will be giving out free socks to the ladies during the clinic. Specifically for the moms of our Bombers and BAM kids, we’re offering discount lessons for women of any level looking to get the most of their time on the mountain. Held from 10 a.m. to 1:00 p.m. each Saturday, this lesson is the perfect length to let you drop your kid off, grab a coffee and catch your lesson right on time.